Submitting to the kind of ‘if you build it, they will come’ hypothesis that served Kevin Costner so well in Field of Dreams, Lion Rock has aspirations of providing the glitz of a harbourfront bar to a Mong Kok clientele. Named after the famous 495m hill that looks majestically over the district (and dominates the view from the new Royal Plaza Hotel bar’s floor-to-ceiling windows), the vista may not be as glamorous as the skyline further south – but Lion Rock compensates in other ways. 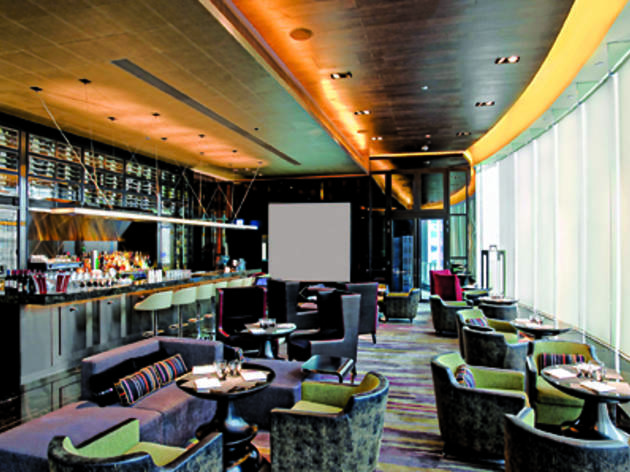 On entering, this super-plush bar envelopes you in a fog of seductive gloom. Each table is lit by a bubble of light emitting from a luminescent egg (think pinks, purples and greens) and it’s all very sophisticated. A DJ spins blissed-out house and other laidback fare, the staff are attentive, the complimentary crisps come with a delicious salsa and we’re presented (quite out of character – maybe this is Field of Dreams?) with a free baseball cap. And there’s a James Bond promotion with a few little 007 exhibits peppering the place. What’s not to like? The menu, that’s what. It comes on an iPad – but perhaps this is just as well considering the amount of trees that would have to perish to print the thing out. Exactly 193 cocktails are served here. Yes, 193, Royal Plaza’s number on Prince Edward Road West. We guess we like the concept but that’s a barrel-load of cocktails, which just isn’t necessary. There are enough bars fixing poor mixes in Hong Kong already and Lion Rock should position itself as a higher class of venue than somewhere with a wipe-clean plastic menu that produces countless cocktails by the vat. Inevitably, the quality is as diverse as the selection is extensive. The Old Fashioned ($85) arrives tasting particularly undignified, with the bourbon overpowering and an almost complete lack of sweetness. The Caipirinha ($85) and Dry Martini ($85) both fare better but they don’t rank up with the best that our city offers. The Whisky Sour ($85) is good – but inexplicably comes served in a martini glass, perhaps indicative of such an unnecessarily cluttered selection. The signature cocktails are much more refined. The Lion Rouge ($108) is both light and fruity with a tantalising tang of raspberry while the eponymous Lion Rock ($98) is the real winner here. A finely balanced concoction of vodka, galliano, pineapple juice and ginger, it’s refreshing while hitting the right notes of sweetness and strength. Ridiculously, though, this star card is not to be found on the iPad menu and has to be specially requested as it changes often (and is, we guess, the 194th cocktail…). This sums up the scattershot approach to menu design. In addition there’s a standard selection of beers and some tasty bar snacks at reasonable prices (we love the nachos, salsa and guac at just $48). And for those with more cash, there are plenty of wines, champers and even cigars, which are presumably to be enjoyed on the little smoking balcony near a side-room at the bar’s entrance.